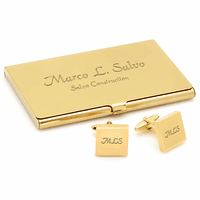 Show your appreciation to both the men and women on your staff or in your department with a business card holder that can be personalized with a special message from you. It's a great way to show thanks and build team loyalty without breaking your budget. A stylish accessory in its own right, the stainless steel case has a smooth silver tone finish and holds up to fifteen business cards. The case can be engraved free of charge and will arrive at their desk or home in an elegant gift box. Create customized messages for each recipient to make the thought even more personal. is it possible to have a logo as well as a name and title on an business card holder? There is a five piece minimum order. If you are ordering five ore more, you would just place your order but under engraving put ***LOGO***. If you want additional lines of engraving, you can enter them on lines 2 and 3. After your order is finalized, reply to your order confirmation email with your logo. We'd put together a proof for your approval or editing within 2 business days. How long before item ships with personalized engraving? 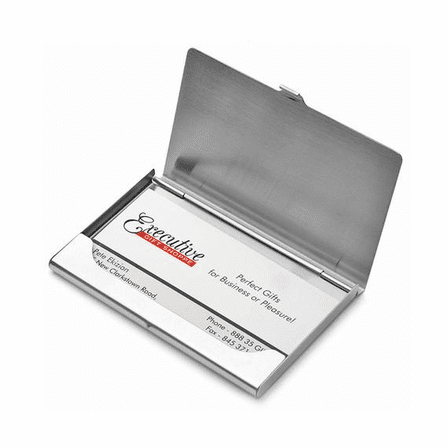 This business card holder would ship the next business day after your order is placed. What size font is typically used for a three initial monogram? 40 seems small, but is 70 too big? Can you write something on the inside? What is the exact font and size of the engraving given as an example? Also, how do I make sure that the name is not split into 2 different rows? When I click to check how I have personalized it, both names come out on 2 different rows. Thank you. We'll adjust the size based on the size you choose. Enter your engraving and choose a size and press the Preview Personalization button, you'll be able to see what size it will be on the card holder. Enter both names on Line 1 to keep the whole name on one line. Unfortunately, this only holds standard sized business cards. The width from top to bottom is 2 1/4" so a 2 1/2" wide card won't fit. I am looking for complete custom engraving, with specific font and artwork. I'm not sure from the responses if this is possible. Also, for such a request, what is the fastest turnaround (assume 50 cases, each custom engraved). We can definitely engrave this card holder with a logo or artwork. We can have it shipped within one business day, as long as the logo/art is good to go. Can you submit your request and artwork here: http://www.executivegiftshoppe.com/logos.html . If possible, please attach the artwork in black and white adobe illustrator .eps format. If not, any black and white format should be usable. I am interested in ordering this product with a personalized engraving. How large is the text in relation to the size of the case? It depends on how much engraving you request. If you have initials engraved, we'll make them larger and if you have a couple lines of text, we'll make it smaller. We center the text left to right and top to bottom. 1. 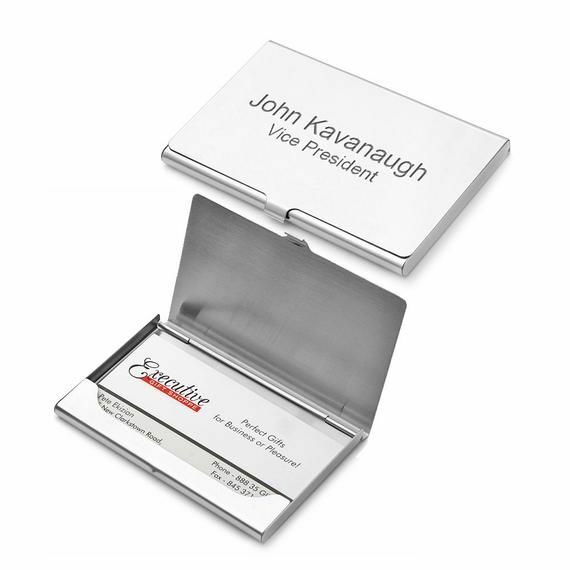 Do you have any stainless steel business card holders made in the USA? 2. Can I get engraving on the inside of the lid as well as on the outside? I dont understand what the fonts listed look like. Do you have a place where I can see how each font actually looks??? Yes, just check the PERSONALIZE box and then select any font. You'll see a dynamic sample of each font as you choose it. I am interested in ordering a Card holder and getting it engraved with a circle monogram. When placing the order, what is the correct way to enter the initial information so that they are placed in the right order in the circle (first, last, middle)? I would really like to order from this website, but am nervous to do so because of the lack of a "preview" feature with the personalization! Thank you in advance for your time and assistance! 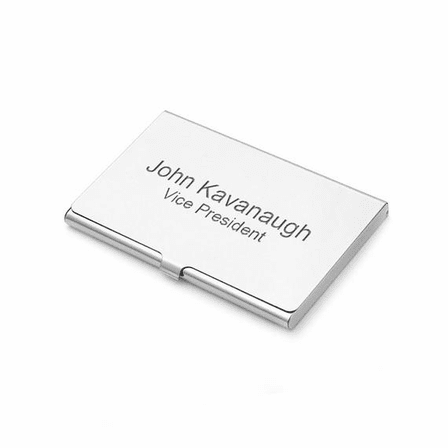 I ordered the Polished Steel Business Card holder. It looks better than I thought it would. I's recommend it to my friends and associates! By Barry T. Betz, Sr. Excellent product and even better service!! The engraved business card holder is as nice as I thought it would be and exactly as Executive Gift Shoppe promoted it to be. 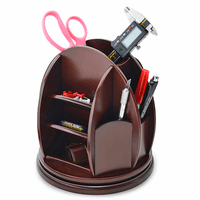 The only thing better than the product itself was the service provided by Executive Gift Shoppe. No overstating the product to induce extra sales, not one misspelled word with the engraving, and their prices are an extraordinary value. Finally, they claim that "most" items are shipped on the next business day. Well, so far, EVERY item that I have purchased from Executive Gift Shoppe has been shipped the next business day plus you get a tracking number!! As soon as you place your order & get a confirmation number, you can be assured that what you ordered will be correct, will arrive on the date given on the tracking number, & you will be completely satisfied. Great job Executive Gift Shoppe and thank you!! ProsThere is not enough room in this little box to say all the good things I have to say about Executive Gift Shoppe so you'll just have to order and see for yourself!! ConsUnfortunately, most companies (internet or retail) do not share the "commitment to quality" put forth by Executive Gift Shoppe and that's very sad. The lady in my life so loves this elegant sophisticated business card holder with her name engraved upon it. She could not thank me enough. For a woman who connects with many people professionally, it is just the right touch, and flattering to her hands and the rings she wears. It is the professional touch that makes the difference in that all important first impression, when business cards are exchanged. It is truly a "Cardinal" gift. We were very happy with the engraved business card holder. It is perfect! When I received this business card holder it was just as expected. It is highly polished steel and the engraving was very nicely done. If I were to purchase another one I would probably spend the extra $2.50 for the carrying pouch. ProsVery high polish and excellent engraving. ConsEasy to leave smudges when handling. 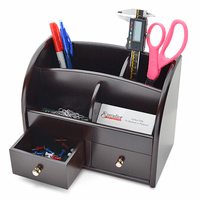 Appears just as it does online... ideal for holding business cards. Looks better in person than on line. Helpful customer service overall GREAT shopping experience. I bought this for my niece for graduation and it turned out very nice with the engraving. I hope she likes it as much as I do! customer service is AWESOME. I thought I might have to return and they said no problem. very helpful and nice. and got back to me quickly. great company to purchase any gift from. Consyou have to use a polish rag to clean smudges. Every time I buy one of these, the recipients have nothing but compliments. This is so well done, every detail is just perfect. Item was exactly as it was described, was delivered promptly, looks very professional. This company is a delight to deal with. I fondly remember the monogrammed business card holder my brother in law gave me when I graduated from college, so purchased this item for a young friend. She loved it and it's a vote of confidence for her future. It arrived quickly, it was beautiful, and the monogram looked lovely. ProsJust what I wanted. Monogram was very nice. Nicely packaged. ConsCouldn't choose to have the monogram anywhere but centered; Mockup showed the letters too close together, but they were just right when it arrived. I would have preferred not to have the Executive Gift logo on the box; would have made it seem more like a piece of fine jewelry without it. I purchased this business card holder for a young woman graduating from law school. She has a side business, so I wanted her logo added to the business card holder. Pete from Executive Gift Shoppe was extremely helpful, and worked with me daily to get a version of her logo that would work. He was always upbeat, and gave me lots of suggestions . We finally got it right. I will definitely purchase from them again. Their customer service and desire to make things work is truly exceptional. You cannot go wrong with them. I bought this as a for my son after his promotion. He seems to like it. I ordered this as a thank you gift for someone and was pleasantly surprised at the quick shipping and beautiful presentation. I received it in less than a week from ordering it, and it looked exactly like the proof image. It arrived in a velvet gift box so I didn't even have to wrap it. I was very pleased with my purchase and the recipient loved it. It is perfect and the engraving is well done. Great customer service as well. This was Christmas gift for our son; high quality, very satisfied with product. My daughter is a high end personal chef here in Napa, and she is EXTREMELY particular about what she uses. I couldn't believe how quickly these gifts arrived. The engraving was top notch. She is going to a private party in Pacific Palisades on 12/10, and I wanted to make sure they would be here in time, and they were, by about a week. Truly amazing products. I have told... oh..., about a jillion people about your great company. Very happy with this product. It's professional looking and my boyfriend likes it alot. I ordered a bag or pouch, to carry the holder in, and I did not receive it.! It states this on my receipt, I paid for it, but it did not ship. Bummed out. This was shipped quickly and looks great. My husband loves it. Case is wonderful. Engraving is perfect! Shipped quickly. Communication was excellent! Would highly recommend! I ordered two business card holders with logo at the beginning of the week and received them by Friday. When I opened the package I found there was no logo on either card holder. I called Executive Gift Shoppe right away and spoke with Pete. Pete was very professional, empathetic, and so just plain nice to talk with! I explained to Pete that I had uploaded my company logo with my order (at least I thought I had) and I received my card holders with no logo. I asked if I could send them back to have the logo etched on them. What Pete said next is something I haven't experienced in years. He told me to hold on to the blank card holders, email him my logo, and he would have it done on Monday and mail them out, along with a return label for me to send the blank ones back... Who does that anymore?? Wow! so refreshing to not only receive outstanding customer service but to feel trusted as a customer is absolutely awesome! Pete actually sent me an email over the weekend to let me know he received my logo and had to tweak it ever so slightly for the engravers to etch it onto my card holders and it would be done on Monday and sent out. On Wednesday I received my card holders WITH my logo on them and they looked fantastic! Wrapped the old ones up and sent them back. Not only will I be doing business with Executive Gift Shoppe in the future, I will definitely being recommending them to others! Keep up the good work! Loved the engraving and quality of card holder! Second time ordering a cardholder. Quality was again great and shipped really fast. Purchased as gift and recipient was in awe. Thank you! Great quality, fast shipping, and excellent customer service. Ordered several of the business card holders for our Board members. The quality of the engraving is top-notch. Everyone was very pleased. Thank you for the fast turnaround and shipping! Beautiful! is there a better college graduation gift?? EASY PEASY to order, customize and ship. Thank you! Beautiful item. Exactly as pictured and described. Fast delivery! We ordered this as a graduation gift for our son. It was the top rated of the items we reviewed on line. It was easy to order, the item came in just a few days, and was just as described. It was particularly nice that the engraving both on the outside and on the inside was at no additional charge and there was an adequate selection of font sizes and styles. The pages to review the order to make sure the engraving was properly specified were particularly easy to read. Well done, all around. And our son loved as he enters on a new job which requires him to have a place to keep -- an present -- business cards.